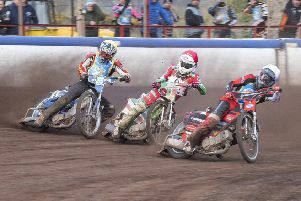 Edinburgh Monarchs today expressed the hope that their influential Aussie speedway star Sam Masters will return to the saddle within the next fortnight following the hand injury he sustained when riding for his Elite League club Leicester Lions last month. Masters is expected to have the wiring removed from his damaged hand on Friday and promoter John Campbel said: “Hopefully after that Sam’s serious recovery can then begin – and he could be back riding again in a couple of weeks. However, Masters will miss a tranche of vital league matches as Monarchs, the current championship leaders, enter a critical month in their push for a play off spot. The Capital outfit face a tough test against Peterborough Panthers on Friday before facing Rye House Rockets and the return fixture against Peterborough on Saturday and Sunday respectively, before moving on to tackle Somerset Rebels in a live televised clash at the Oak Tree Arena next Tuesday. Monarchs will continue to use the rider replacement for Masters until he is fit again after skipper Craig Cook moved back to the No.1 spot under the new set of green-sheet averages.